Clash of Kings was one of the most popular online role-playing games of all time with more than 50 million downloads. It seems people just loved the idea of being able to build their own cities and empires and test their metal against competing empires. This was a game packed full of rich features and great battle scenes that left very little to the imagination. The problem was that in-app purchases tended to favor the big spenders at the expense of others trying to advance through the game using mostly their skills and intuitiveness. This problem was of particular concern for Western users where the in-app purchases were more expensive than in the East and probably contributed to more than a few users losing interest over time. 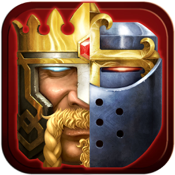 ELEX Wireless, the developers of Clash of Kings, wanted to create a game that eliminated many of the concerns that users had with the original Clash of Kings and the result was Clash of Kings: the West. It features all of the aspects that people loved in the first game and a whole lot more to boot. This is a free app and it’s compatible with the iPhone, iPad, and iPod touch. This new game is specifically tailored to Western players. The landscapes and battles are very Western oriented, but, more importantly, the playing field has been leveled so that you can be competitive even without a lot of in-app purchases. There is less of an advantage for people that use in-app purchases so that the game remains competitive and interesting for everyone. If you do wish to use in-app purchases to gain a bit of an advantage the developers have made them more affordable as well. The overall objective hasn’t changed a lot. In this game you’re still trying to build your cities, establish alliances with other online users, and ultimately build an empire. It’s just that the playing field is a lot more even with the intention of keeping as many people as possible engaged so that you’ll continue to play the game on an ongoing basis. It seems like a sound strategy for a company looking to make their game as popular as possible. Another great feature of this game, is that it’s a lot more forgiving when things do start to go wrong. If your castle is being bombarded and it looks like you’re about to lose the battle, the King will actually send in reinforcements so that you can keep playing. It’s hard to get into a game if you’re battling a superior opponent that takes you out of the battle before you’ve ever really got started and the developers have clearly addressed this problem. This version of Clash of Kings is meant to keep everyone playing for as long as possible. While it’s nice to know that the King will send your reinforcements when the battle doesn’t seem to be going your way, the help doesn’t stop there. If your resources are really being drained because of attacks on your realm then you’ll receive extra resources to help you rebuild and get back on your feet again. In fact, some might argue that they’ve gone too far in the opposite direction, making things a little too easy – after all everybody likes a bit of a challenge. From the very beginning, you’ll notice a difference in the fairness of the game. As we’ve already mentioned, if you’re losing a battle reinforcements will be sent your way, but it’s not just that – individuals that do pay to gain an advantage don’t gain as large of an advantage as they did in the past. This means, with a little bit of perseverance, you can be successful in the game even without using in-app purchases. You really can develop strategies that will help you succeed based on your own skills and not just how much you’re willing to pay. In the original Clash of Kings, cheating was a common problem and the developers have recognize this as well. In this Western version, they’ve included an official mailbox that you can use to report cheating before it gets out of hand. The idea here is to prevent any unfair advantages for one player over another and it’s a welcome addition for sure. Get help if you are losing the battle! A review of a game like this wouldn’t be complete without talking about some of the extra cool features they’ve added. I can only speak for myself, but I’ve always found dragons to be one of the coolest creatures around (not literally of course). That’s why I was quite excited to find out that this new entry in the Clash of Kings catalogue actually allows you to catch a dragon, tame it, and send it after your enemies. There’s nothing like a little dragon fire to even the playing field. There aren’t many things that have a bigger ‘cool factor’ than being able to tame a dragon, but battling Vikings and defeating them has to be a close second. In Clash of the Kings: The West, you’ll have that opportunity as you get a chance to pitch your own army against Viking pirates and if you’re successful you’ll win a chest of gold to add to your budding empire. You can’t help but be impressed by a game that lets you tame dragons and defeat Vikings. It’s hard to see how a developer could top one of the most successful online role-playing games of all time, but with Clash of Kings: The West, the team at ELEX Wireless may just have figured it out. They’ve made the gameplay a lot fairer for those that don’t want to spend a fortune on in-app purchases and they’ve done it without sacrificing a lot of the great features that players have come to love in the Clash of Kings universe. I’ve always been a bit sceptical with sequels, but with this effort I think ELEX Wireless may just have won me over. This great game will keep you occupied for hours at a time. Allan is a freelance writer who loves scouring the App Store for exciting, intriguing and unique apps.